From 17/10/2011 to 23/10/2011, two thousand (2000) youths from Africa, Asia-Pacific, Latin America, North America and Europe will come together to discuss the concept of “Global Youth Empowerment-a major development asset”. These young people from different parts of the world use the concept of “global empowerment” or related practices in their daily work as youths across all disciplines. The Conference is being organized jointly by the World Youth Parliament , strategic partners and other stakeholders around the world aimed at: to jointly explore, reflect and deepen the different dimensions of youth empowerment across the globe. The Conference shall also better define the needs of youth organizations, youth workers and youth leaders of all regions of the world, and to contribute to sustainable strategies, with a youth mainstreaming approach, towards more effective and efficient global youth empowerment processes. At the end of this Conference, we seek to present a common understanding of Global Youth Empowerment and provide possible Ways Forward. A common understanding of Global Youth Empowerment encourages awareness of the interdependency between peoples’ local realities and the global perspectives. It stimulates people to critically approach these increasing dependencies and the changes it is going through. Global Youth Empowerment includes all stakeholders in its entire process. It is as well a methodology as it is a set of global issues. Global Youth Empowerment has an emancipatory perspective of change by all relevant parties involved. So we understand ‘global’ as being the World and its issues, as well as a holistic approach to youth empowerment and as an empowerment for all. We ask ourselves if a stable definition of Global Youth Empowerment is needed at all. A less rigid definition urges all parties involved to keep an open spirit in order to continuously question this definition critically through participation of all especially the least empowered youth in our societies. We understand that there are several definitions of the emerging concept of Global Youth Empowerment. Some of them we find very inspiring: the definition formulated by the UN Youth Charter, Pacific Youth Charter, African Youth Charter and the Earth Charter amongst others. Various political processes and commitments exist that share the vision of a more just and sustainably developed world with the vision underlying Global Youth Empowerment. These processes will benefit from being linked with Global Youth Empowerment. In particular the Earth Charter, the UN Culture of Peace and the Millennium Development Goals are valuable processes that can be supported by Global Youth Empowerment and vice versa. We recognize the strong points of these definitions, but also realize that these are just different versions of Global Youth Empowerment, originating from institutions or networks with different backgrounds, and thus putting emphasis on certain aspects of Global Youth Empowerment. As already mentioned Global Youth Empowerment is a transformative involvement of youth. Throughout its process, Global Youth Empowerment continues to reflect the changes on processes as well as provoking the actors involved to critical thinking. It has to adapt throughout time, as well as space towards the local context. Global Youth Empowerment will change its stakeholders and its stakeholders will change Global Youth Empowerment. Global Youth Empowerment is a progressive concept originating from a World Youth Parliament context and inspired by other visions from all over the world. This provides essential contribution to the concept of Global Youth Empowerment and its understanding, as Global Youth Empowerment is contributing to these visions. These visions are all originating from certain regional contexts. Its force is the dialogue between these different visions since these visions are all voicing a similar movement, addressing similar concerns and using similar methods. The process of dialogue links different educational concepts from different regions and realities and allows new empowerment theories to spread into creative thinking and practices all over the world. Various other empowerment approaches exist such as the Peaceful Empowerment, the Inter-cultural Empowerment, the Human Rights Empowerment, the Citizenship Empowerment, the Development Empowerment, the Environmental Empowerment, the Refugee Empowerment, and the Education Empowerment, etc. These can all be connected without being replaced by Global Youth Empowerment and form specific approaches to tackle specific local or regional issues. Global Youth Empowerment can only be effective when properly placed in the local context. Global trends impact local realities and vice-versa. So, we recognize that it can be used in different environments, and should be properly adapted to the local reality. It should be implemented in local, regional as well as global environments. Thanks for reading and kindly let me know how I may help you with further information. 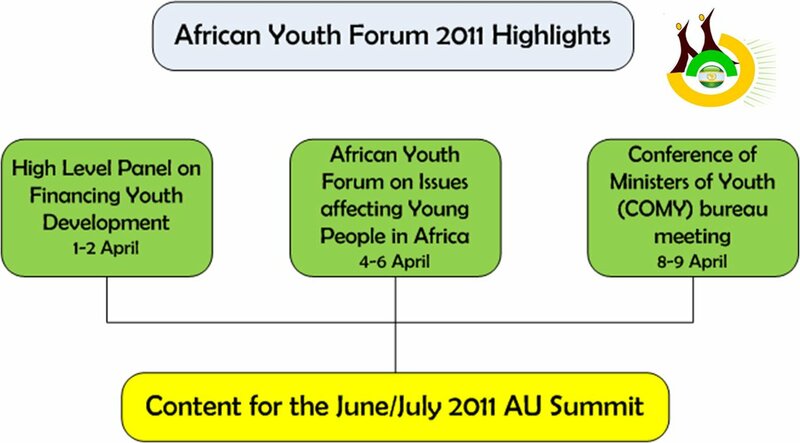 The African Youth Forum is coming up from 1 – 10 April 2011, Addis Ababa, Ethiopia. During the 15th Ordinary Session of the African Union Heads of State and Government, held in Uganda in 2010, the Assembly adopted ‘Accelerating Youth Empowerment for Sustainable Development’ as the theme for 2011 Summit. Do you want to find out how to become a participant from and how to become accredited? Kindly follow http://www.africa-youth.org/ayf.jsp for further details. AU Summits are part of the mechanisms used by African leaders under the auspices of the African Union to deliberate and take action on commitments, upcoming issues and policy framing on social, economic and political aspects that affect African countries. The forum will raise awareness and call for effective commitment and actions on the part of all stakeholders and partners at all levels to effectively mainstream youth concerns into development policies, programs, strategies and practices in Africa. The Forum is also intended to strengthen Africa’s participation and engagement in the International Year of Youth with a view to ensuring that its concerns and priorities are adequately reflected. Showcase the significant innovative advancements of African youth, including the Diaspora in their research and scientific activities and achievements and its contributions towards sustainable development. Strengthen/build new strategic alliances and partnerships among youth networks within and outside Africa. Strategic alliances and partnerships on the Plan of Action. Thanks for taking your special time reading and considering this opportunity. You are always welcome to write me; I will be glad to respond to your comments or messages.